Sometimes you want to test if changes you are about to make to a CRUSH map will cause data to move or not. In this case I wanted to change a rule in CRUSH where it would use device classes, but I didn’t want any of the ~1PB of data in that cluster to move. 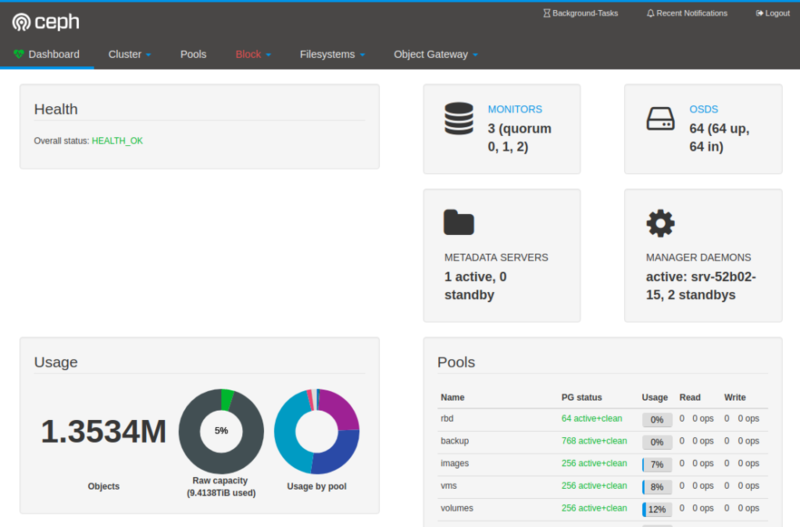 The Ceph Mgr dashboard plugin allows for an easy dashboard which can show you how your Ceph cluster is performing. In certain situations you can’t contact the Mgr daemons directly and you have to place a Proxy server between your computer and the Mgr daemons. You can now point your browser to the URL/IP of your HAProxy and use your Ceph dashboard. In case a Mgr machine fails the health checks of HAProxy will make sure it fails over to on of the other Mgr daemons. When migrating from FileStore with BlueStore with Ceph Luminuous you might run into the problem that certain Placement Groups stay stuck in the activating state. This is a side-effect of the new PG overdose protection in Ceph Luminous. Too many PGs on your OSDs can cause serious performance or availability problems. Then restart the OSDs and MONs which are serving the affected by this. Usually you shouldn’t run into this, but if this hits you in the middle of a migration or upgrade this might save you. When checking a Ceph cluster it’s useful to know which versions you OSDs in the cluster are running. 10 "ceph version 10.2.6 (656b5b63ed7c43bd014bcafd81b001959d5f089f)"
1670 "ceph version 10.2.7 (50e863e0f4bc8f4b9e31156de690d765af245185)"
426 "ceph version 10.2.9 (2ee413f77150c0f375ff6f10edd6c8f9c7d060d0)"
66 "ceph version 12.2.1 (3e7492b9ada8bdc9a5cd0feafd42fbca27f9c38e) luminous (stable)"
So 66 OSDs are running Luminous and 2106 OSDs are running Jewel. Many new disks like the Seagate He8 disks are using a technique called Shingled Magnetic Recording to increase capacity. As these disks offer a very low price per Gigabyte they seem interesting to use in a Ceph cluster. Due to the nature of SMR these disks are very, very, very bad when it comes to Random Write performance. Random I/O is something that Ceph does a lot on the backing disks. This results in disks spiking to 100% utilization very quickly causing all kinds of trouble with OSDS going down and committing suicide. The solution is very simple. Do not use SMR disks in Ceph but stick to the traditional PMR disks in your Ceph cluster. In the future we might see SMR support in the new BlueStore of Ceph, but at this moment no work has been done, so don’t expect anything soon. For the Ceph training at 42on I use VirtualBox to build Virtual Machines. This is because they work under MacOS, Windows and Linux. For the internal Git at 42on we use Gitlab and I wanted to use Gitlab’s CI to build my Virtual Machines automatically. As we don’t have any physical hardware at 42on (everything runs in the cloud) I wanted to see if I could run VirtualBox Headless inside a VM with Nested KVM enabled. Now that’s verified I tried to install VirtualBox. Installing VirtualBox is straight forward. Just add the repository and install the packages. Don’t forget to reboot afterwards to make sure all kernel modules are loaded and properly installed. The trick to get everything working properly is to install Oracle’s VirtualBox Extension Pack. It took me a while to figure out that I need to install it manually. It wasn’t done by default after install. You need to download the pack and install it using the VBoxManage command. vboxmanage setproperty vrdeextpack "Oracle VM VirtualBox Extension Pack"
With that installed and configured I rebooted the machine again just to be sure. When a I/O operating inside Ceph is taking more than X seconds, which is 30 by default, it will be logged as a slow request. This is to show you as a admin that something is wrong inside the cluster and you have to take action. Slow requests can happen for multiple reasons. It can be slow disks, network connections or high load on machines. Yesterday I got my hands on a Ceph cluster which had a very high number, over 2k, of slow requests. This is hard to diagnose and it was. Usually this is where OSDs are busy connecting to other OSDs or performing any other network actions. Usually when you see ‘waiting for rw locks’ there is something wrong with the network. In this case the Ceph cluster is connecting over Layer 2 and that network didn’t change. A few hours earlier there was a change to the Layer 3 network, but since Ceph was running over Layer 2 we didn’t connect the two dots. After some more searching we noticed that the hosts couldn’t perform DNS lookups properly. Ceph doesn’t use DNS internally, but it could still be that it was a problem. After some searching we found that DNS wasn’t the problem, but there were two default routes on the system where one was down. This Ceph cluster is communicating over Layer 3 and the problem was caused by the fact that the cluster had a hard time talking back to various clients. This caused various network buffers to fill up and that caused communication problems between OSDs. So always make sure you double-check the network since that is usually the root-cause.